It’s been a long two-year wait for a new Skryptcha single. Following a national tour with Illy & Chasm, the Sydney MC took a long-term break from the industry due to personal reasons and questioned whether he would ever return. 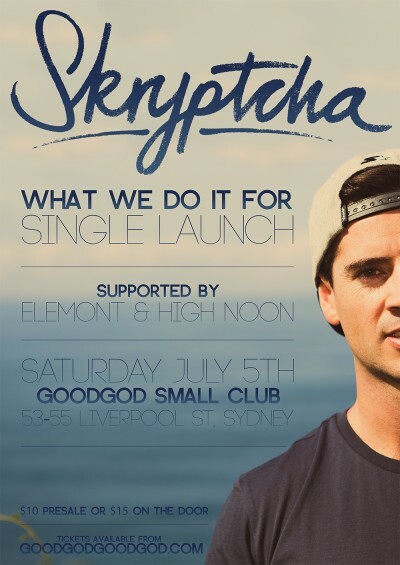 Luckily, he’s back with ‘What We Do It For’, featuring the soulful tones of singer Daniel Mifsud (Evan & the Brave) who also joins Skryptcha live on stage, along with one of the country’s finest beatsmiths, Chasm. Now it’s time for his comeback party, in the Danceteria with Elemont and High Noon. Get amongst it!